Are you a garden enthusiast? If so, Direct Gardening, online at DirectGardening.com is the perfect place for you. This store will become your one-stop shop for all of your gardening necessities including Angel Trumpets, bulbs, container plants, Daffodils, Dahlias, Daylilies, flower seeds, fruits and nuts, ground cover, hedges, and herbs. Plus, you can also find Irises, Lilies, ornamental grasses, perennials, preplanned gardens, roses, shrubs, trees, tree peonies, vegetables, vines, and of course garden supplies. With merchandise from high-end producers and distributors including House of Wesley, Royal Dutch, Burgess Seed & Plant, Exciting Gardens, Four Seasons Nursery, Honeycreek Nurseries, and more, your plants and supplies are guaranteed to be the highest quality around. Begin your shopping today and be sure to stop by RetailSteal.com for all the best Direct Gardening coupons, Direct Gardening savings, and Direct Gardening discounts. 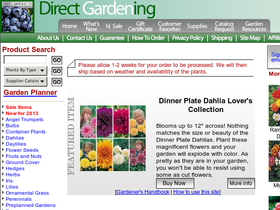 Direct Gardening only ships to the United States, Puerto Rico, and the Virgin Islands. Shipping costs vary. See website for details. Check out the sale section at Direct Gardening and enjoy up to 50% off a variety of plants, vegetables, and flowers. Shop online at DirectGardening.com and enjoy free gifts with minimum purchases. Check back often as gifts change weekly. Get your perennials from Direct Gardening and save up to 30%. Use this coupon code at Direct Gardening and enjoy 3 free Peacock Orchid Bulbs with any purchase. Get a free Trip L Crop Tomato plant with any purchase from Direct Gardening - for a limited time only. Click link to buy. Receive 1 free rose with any order from Direct Gardening when you use the coupon code. Click link for savings. Make a purchase and get a free hosta using the coupon code online at Direct Gardening. Click link for savings. Use the coupon code at Direct Gardening and get one free daylily. Click link now. At Direct Gardening, use the coupon code and receive 10 free Blue poppy anemono Bulbs with your online order. Click link to purchase. Use the coupon code at Direct Gardening and get three free Ranunculus bulbs with your online order. Click link to save. Act now and shop the 1¢ sale at DirectGardening.com and you can enjoy big savings on your favorite flowers and vegetables.